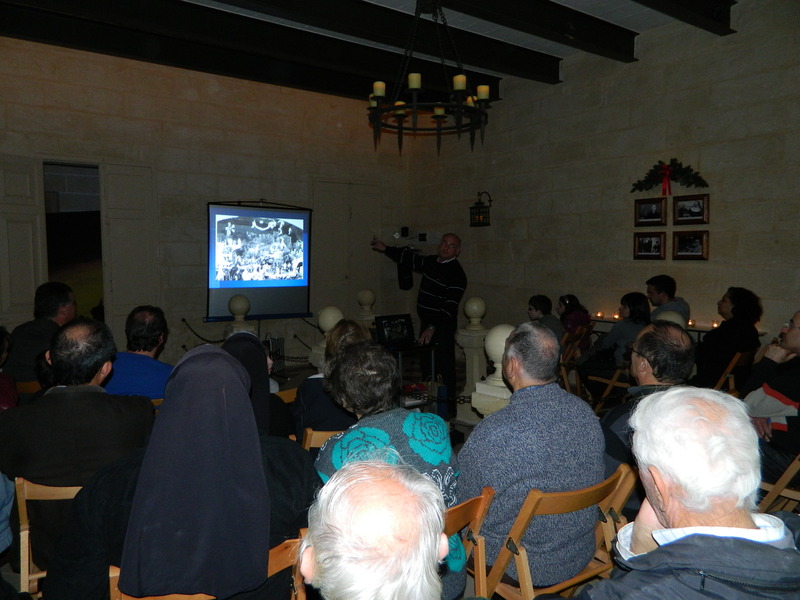 For this activity the hall in front of the mechanical crib at the Jesus of Nazareth Institute at Zejtun was packed with an audience listening to a presentation delivered by Joseph Pavia on the on-going restoration works on this 65 year old crib. 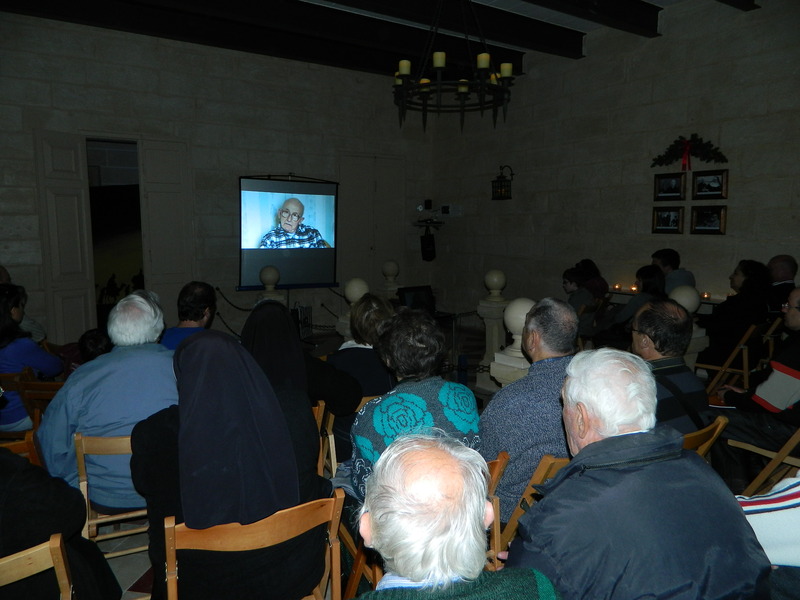 The activity started with the projection of an interview with Pawlu Pavia, Joseph’s uncle, who was responsible for developing the mechanism which drives the movement of the crib figurines. Following this interview, Joseph explained to the audience the work done so far on the crib in order to extend its lifespan. He also showed images of the precarious condition of parts of the crib which unless restored shortly, there is a risk of loosing parts of this crib. This crib now forms part of our ethnographic heritage of Zejtun and it is important that we support all initiatives aimed towards its conservation and restoration. 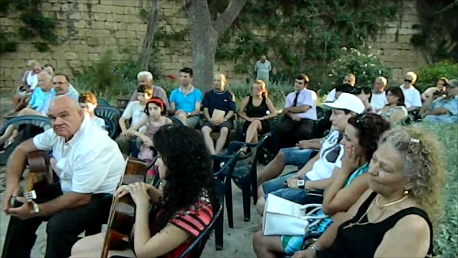 On Friday 6th July, Wirt iż-Żejtun organised an informative and entertaining evening at the Luqa Briffa historic garden. 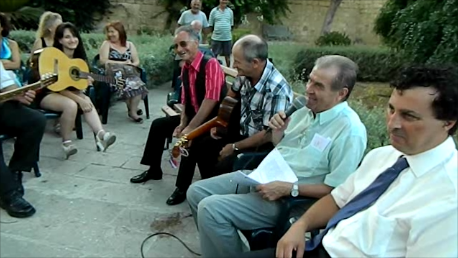 This year’s activity had Maltese Għana (folk singing) as the main theme. Invited as mains speakers for this activity were Mr Charles Coleiro; who needs no introduction when discussing this subject, and the researcher Mr Steve Borg. 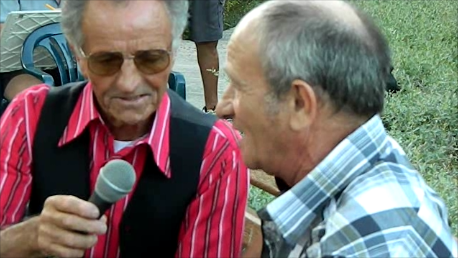 Mr. Coleiro described in detail the evolution of the Maltese Għana and explained the various forms and styles of local folk singing. 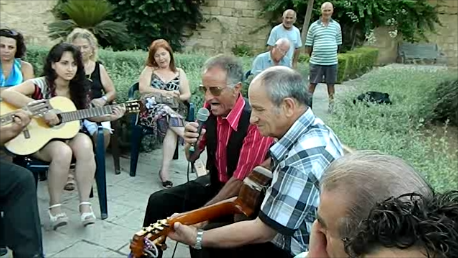 Examples of such styles and forms were given by għannejja (folk singers) from Zejtun who were also invited for the activity. Mikiel Cumbo u Żeppi Spagnol accompanied by guitar players Gustu Zammit u Janice Spagnol started by singing a botta u risposta or as is commonly known għana spirtu pront (immediate reply). Janice also sang a similar piece with her father Żeppi. The Mr. Coleiro explained what is meant by l-għana la Bormliża, followed by a piece sang by Mikiel Cumbo. 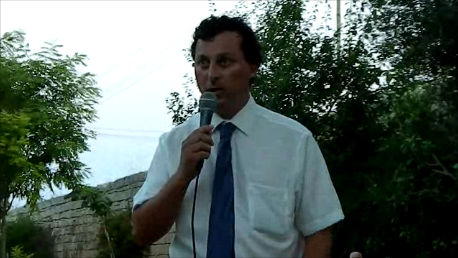 Zeppi sang a piece from his għana tal-fatt (factual song) about the tragic traffic accident which occurred at Triq Anton Buttigieg in 2009 after an explanation about such style by Charles Coleiro. Janice then sang a piece known as għana tal-banju, usually sang by women during their cloth washing. Mr. Steve Borg started his presentation by distinguishing through examples, the difference between tangible and intangible heritage. 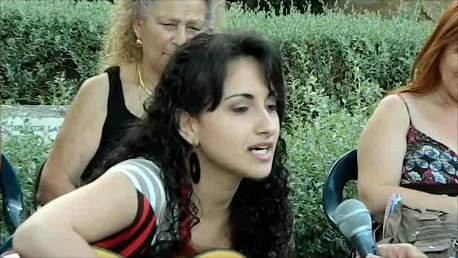 Maltese folk singing falls under the latter section of heritage. He than continued by taking those present around a number of south European countries and identifying what they are doing in order to save and promote their intangible heritage in particular to folk singing and folk musical instruments. Steve was continuously questioning: “What are we doing to safeguard our folk singing?”. He gave an overview of what was done by the Friends of the National Archives after they acquired a collection of old tape-recordings of one of the Maltese Folk singers, and how these have been conserved and preserved at the National Archives as part of the National Collection. He then shared with those present a number of old photographs showing għannejja from Zejtun singing in different wine bars. 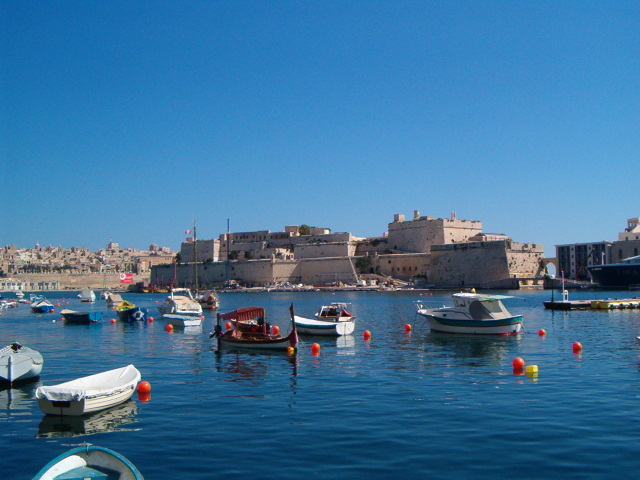 Those present also listened to old extracts of digitally converted of Maltese għana. 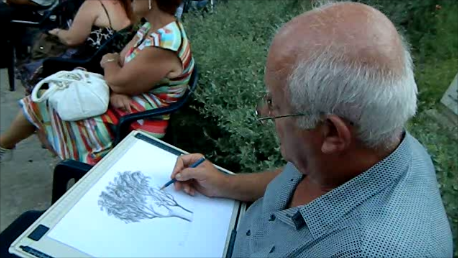 The Zejtun artist, Joe Baldacchino was also asked to participate in this activity by rendering the event through life painting, thus hinting the link between the local għana and art itself. 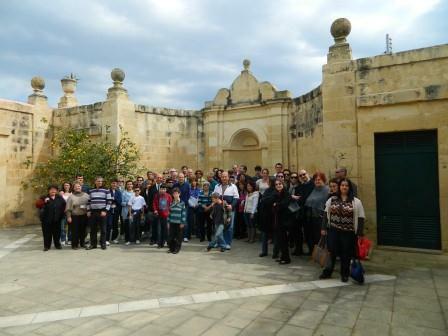 This activity was well attended not only by members from Wirt iż-Żejtun but also by people living outside Zejtun. Interesting questions were raised by those present after the presentations. The activity was concluded by refreshments. We are grateful to the Zejtun Local Council who granted us access to this historic garden and to the Zejtun Parish for lending us the chairs and the amplifier. On the Sunday morning of 3rd June, Wirt iż-Żejtun has organised a group visit to Fort St Angelo right at the start of a restoration project lead by Heritage Malta and partly funded through the European Regional Development Fund. The group, among whom were members of Wirt iż-Żejtun, were guided by the fort’s curator Mr Matthew Balzan. All started at the Inquisitor’s Palace in Birgu where at the moment there is a temporary exhibition set and aimed at explaining graphically this project. Then the group were taken around the fort, with the curator explaining in detail the highlights of the project. Those present had the opportunity to give their views and opinion on what is being proposed by Heritage Malta. All those present appreciated the work being done by this national agency to safeguard this historical jewel and the way it is going to be presented to the Maltese people and foreign visitors. Our next cultural walk, this time conducted in Maltese, took us around ir-Raħal ta’ Fuq. During this walk we discovered the two old hamlets of Ħal-Biżbud and Ħal-Ġwann, or as are commonly known nowadays – ir-Raħal ta’ Fuq. Within this area, besides the two chapels of Santa Marija and Tas-Sinjura, which thanks to the Żejtun Parish were visited during the tour, there are a number of buildings which have strong links with the Order of St. John and others which were owned by Maltese Noble families. Even in the modest and poor houses there is a lot to be discovered such as the muxrabija, l-imsaqqfa and ix-Xaqq ta’ Tilla. All those attending confirmed that this was an eventful morning, this applied also to those who live within or close to this area, who viewed their neighbourhood through a different perspective. 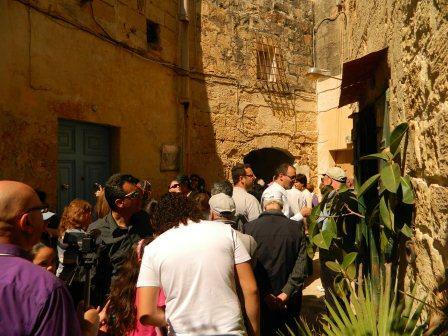 At the Zejtun Parish Church, Wirt iż-Żejtun has organised its annual activity linked to the Holy Week traditions and religious celebrations. This year the event consisted of a public interview with the Zejtun born artisan and restorer, Vince Abela. Vince is a wood furniture restorer who has been working in this sector for the last twenty years. After being employed with the Department of Museums and later with Heritage Malta, he now moved to the Office of the President where he is responsible for the maintenance and restoration of the furniture in the presidential palaces. Vince is also one of the enthusiasts of the Good Friday celebrations and procession at Zejtun. In fact he is the person responsible for the statue of Jesus at the Gethsemane. He has been directly involved in the restoration of a number of wooden bases of the statues, most of which elaborately crafted with wood inlay. In the past years is also crafted new works of art and completed other works. At the moment he is manufacturing a new base for the Judah statue. Last year he restored the artistic cross of the Redeemer statue. It was through this job that Vince made an important discovery about this cross. When he was restoring the cross, at one of the ends of the cross, after removing a detached wooden part, he discovered the signature of the manufacturer and the date when this work of art was done. The signature was that of Mose’ Dalmas and the date was 7-3-12. Besides giving information about this important historical event, Vince spoke passionately about the craft of inlaying and gave detailed explanations not just about the tools and equipment used but also about the different forms and styles of this craft.This discovery in fact was the main reason why this year Wirt iż-Żejtun decided to have this event related to this artistic craft. The Redeemer cross celebrated its 100th year since when being crafted. 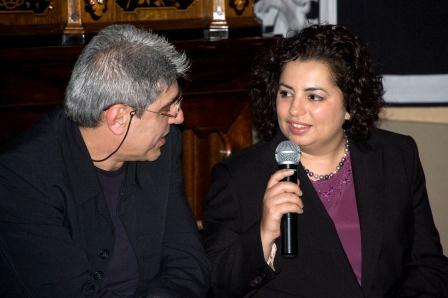 This interview was lead by the journalist Fiona Vella and was done in front of a very well focused audience who ere quite eager to listen. Wirt iż-Żejtun held its first cultural walk this year which was a repetition of last years tour but this time conducted in English. In all we had a group of almost sixty people who met on the parish church parvis and started the tour at quarter to ten. Members of Friends of the Maritime Museum were amongs the persons present. There was also a good representation of non-Maltese speaking Zejtun residents how were extremely interested in our heritage. 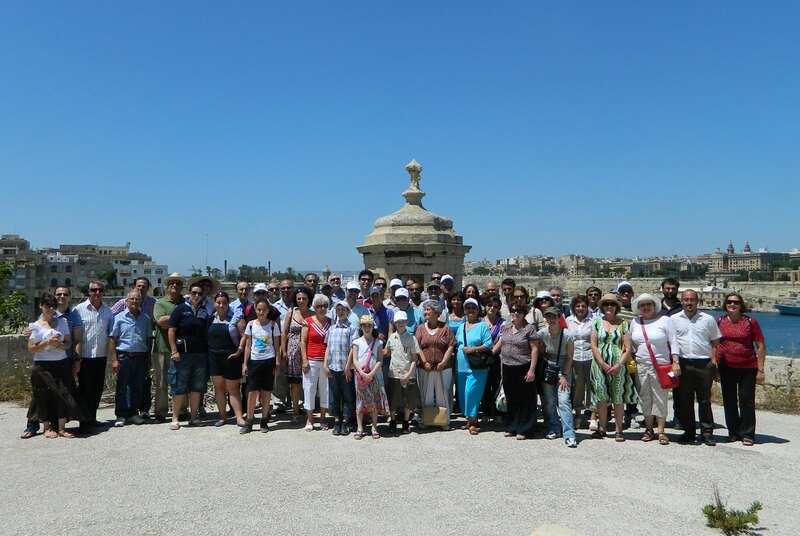 The tour passed through Triq Ħabel ix-Xgħir to the Transfiguration (is-Salvatur) chapel. The group visited the interior of this chapel as it also did with the other chapel visited – Saint Clement’s. Along the route there were various stops in front of a number of buildings including a medieval building in Triq San Bastjan (Ħal-Tmikki) and what was the house of Clement Tabone in Triq San Klement. At the lowest part of the town, we had the opportunity to see the medieval interface between the rural and the urban areas of the town along Ħajt il-Wied. The group had also the opportunity to enter into the courtyard of Villa Cagliares after which we started our way up to the town’s main square via Triq il-Kbira. 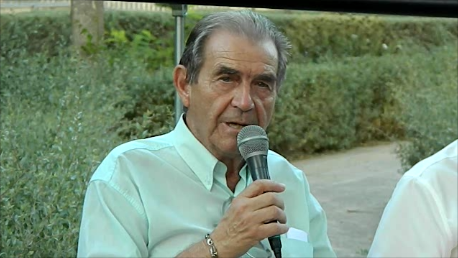 The tour was led by Wirt iż-Żejtun president, Perit Ruben Abela.